Wisconsin has significant racial disparities in infant mortality. 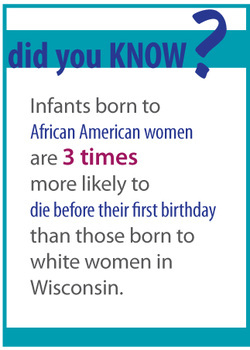 The Healthy Birth Outcomes program focuses on eliminating racial and ethnic disparities in birth outcomes in Wisconsin. Currently, efforts focus in Racine County because of its high infant mortality rates and racial disparities. Other counties with high infant mortality rates include Rusk County, Bayfield County, Iowa County, and Vilas County. The 2013-2015 budget flat-funded the program with $222,700 annually. In the 2011-2013 biennium, the program was cut by $24,800. The proposed budget continues to fund infant mortality programs at current levels ($222,700 per year). These funds are the only state funds directly allocated to reducing disparities among infant mortality rates. The Legislature approved the Governor's proposed Infant Mortality Program budget in its entirety. In Wisconsin, African-American infants are three times more likely to die before their first birthday than white infants. The overall Wisconsin infant mortality rate in 2012 was 5.7 deaths per 1,000 live births, compared to 14.7 deaths per 1,000 live births among African Americans. This inexcusable and persistent inequality is most prominent in Kenosha, Beloit, Milwaukee, and Racine, where 90% of African-American births occur. Infant mortality prevention focuses on reducing preterm births and low birth weight babies through community-based solutions. Unfortunately, state funding directed to infant mortality is very low, so other organizations and programs like UW-Madison’s Lifecourse Initiative for Healthy Families must step in to help provide the adequate resources to address this serious issue.